The structure Dionysus in’69 is loosely based around Euripides play that deals with the myth of Dionysus and his revenge upon the city responsible for his mortal mother’s death. Shot in 1968, while De Palma was a film student at NYU, the film captures a presentation by experimental-theater ensemble the Performance Group. 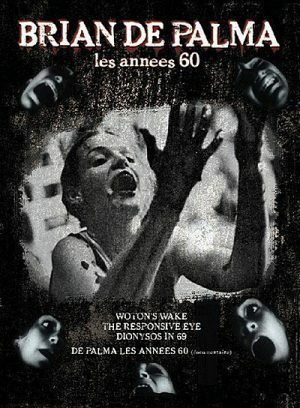 The Responsive Eye is a straight forward documentary in which we are introduced to works of perceptual and optical art. There is a narrator who leads us through this tour of the museum and we also get to hear audience members react to the art. Wonton’s Wake is more of a collage of ideas then a straight forward story. Wonton is a misfit who attacks women and collects souvenirs from their corpses. This short is filled with amazing iconic images like broken glass and black gloves both which would become fixtures in Italian thrillers. The extras included on this DVD are kind of a mixed bag as most of them are offered in French with no English language options. Extras include brief introductions for Dionysus in’69, The Responsive Eye and Wonton’s Wake all which come with French only language options. The final extra is twenty five minute documentary about Brian De Palma. The only parts that are in English are when De Palma speaks and the rest is in French when the narrator speaks. De Palma spends most of the documentary speaking about his films and the filmmaking process.